The last chance most of us will ever have to see the planet Venus pass in front of the sun is coming up this Tuesday (June 5). On that day, more than half the world will get to see an exceedingly rare event: a transit of Venus crossing the face of the sun at inferior conjunction. A transit of Venus is among the rarest of astronomical events, rarer even than the return of Halley's Comet every 76 years. Only six transits of Venus are known to have been observed by humans before: in 1639, 1761, 1769, 1874, 1882 and most recently in 2004. When Venus is in transit across the solar disk, the planet appears as a distinct, albeit tiny, round black spot with a diameter just 1/32 that of the sun. This size is large enough to readily perceive with the naked eye; however, prospective observers are warned to take safety precautions (as with a solar eclipse) in attempting to view the silhouette of Venus against the blindingly brilliant face of the sun. Special glasses or telescope filters must be used at all times. The entire transit will be a west-to-east passage (right to left) taking six hours and 40 minutes. The sun will be above the horizon for the whole transit for much of Greenland and far-northern portions of Canada, all of Alaska and Hawaii, central and eastern Asia, New Zealand and the eastern half of Australia. 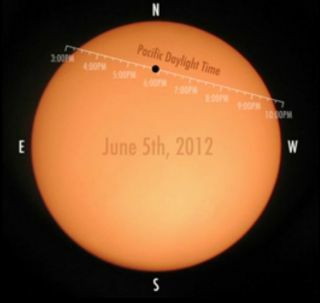 For these last three regions, the transit will occur on June 6. The sun rises with Venus already on its disk for western Asia, the eastern half of Africa and virtually all of Europe on the morning of June 6. Interestingly, as seen from Iceland, the beginning and end of the transit will be visible, but the sun will set prior to, then rise after, the middle of the transit. One region that will miss the transit is a large portion of South America. From places south and east of an imaginary line drawn between Morawhanna, Guyana, southwest to Tacna, Peru, the sun will unfortunately set before the transit begins. In addition, a large part of western Africa as well as Portugal and the western half of Spain will also miss out, because from there the transit will end before the sun rises. For the United States and Canada, the transit will begin when the dark disk of Venus first touches the outer limb of the sun, known as Contact I. From the Eastern United States and Eastern Canada, Contact I should occur within about a minute of 6:03 p.m. EDT. From the Western United States and Western Canada, Contact I should occur within about a minute of 3:06 p.m. PDT. It will take about 18 minutes for the black disk of Venus to move completely onto the sun's face, ultimately bringing its black disk just inside the sun's upper left edge. This will be an especially interesting time. Another way to describe the sight is that the planet will seem attached to the sun's limb by a thin black column or thread. This optical illusion is known as the "black drop effect." Its cause is believed to be the combination of local atmospheric seeing and telescope diffraction, in conjunction with the dark disk of Venus interacting with the limb darkening of the sun's outer edge. Venus will then take more than six hours to traverse the disk of the sun, although for most Americans (except in Alaska and Hawaii), sunset will intervene before Venus moves off of the sun. But take heed: should clouds prevent you from getting a view of this year's event, it will be most unfortunate, since the next opportunity to observe a transit of Venus will not occur until December 10-11, 2117! We can expect that very few people who witness this year's transit will still be alive to catch the next one in 105½ years.